This sticker questions the notion of “homeland” from a Native American position. The U.S. Department of Homeland Security is a group of federal departments and agencies formed in 2002 after the September 11, 2001, attacks on American soil. 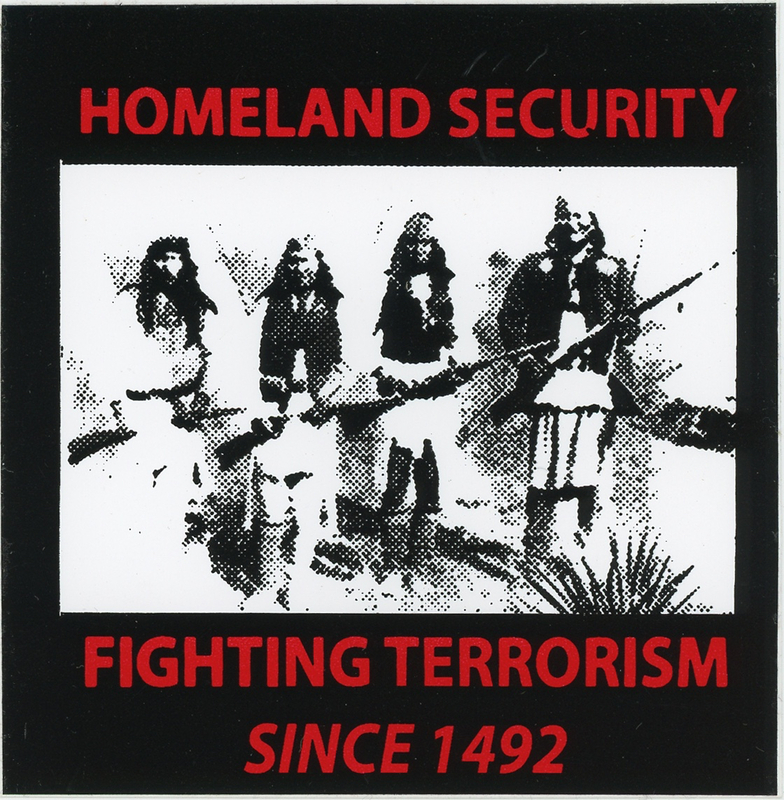 Three of its five core missions include “prevent terrorism and enhance[e] security; secure and manage our borders; and enforce and administer our immigration laws.” Based on a T-shirt design by Matthew Tafoya, a Navajo, the sticker presents a negative viewpoint toward the colonization of America by European settlers. It proposes the 21st-century fight against the so-called “War on Terror” actually started in 1492, the date Christopher Columbus sailed from Spain and “discovered” the Americas. The sticker features a photograph taken in 1886 of the Bedonkohe Apache resistance fighter Geronimo (1829-1909) on the right and three armed warriors on the left. Considered to be the last Apache holdout, Geronimo fought for many years against Mexican and American settlers and their attempts to expand onto Apache tribal land.